Logan reacted to the news that we were going on a different vacation then we usually do with his typical apprehension. He asked a lot of questions and had to work through a lot of scenarios in his head before he was on board with a new destination. Actually... he really didn't want to go at all if it could be helped. I did my best mommy convincing to put him at ease. Logan: Mom I don't want to go to Alberta. Why can't we just go to Thompson like we usually do? Me: Because mommy wants to visit her family. Everyone will be there. ... And.... uh... you'll get to see Mr. Kitty. Logan: (visibly perked up) Oh ... well... if we get to hang out with Mr. Kitty, then maybe it'll be a good holiday. Mr. Kitty is my sister and her husband's fur baby. He's a big orange cat who is very affectionate and very calm and laid back. I secretly did a quick prayer that Mr. Kitty was still with us. I don't remember my hearing anything to the contrary, so I figured this sort of incentive might just work. When we arrived in Lethbridge on Friday afternoon, we weren't sure where we were all meeting but I had a good guess that maybe someone would be home at my sister's house. The kids were on board with that because they were going to get to see Mr. Kitty's house. Not my sister's house, not uncle Mark's house, not even the house I lived in when I was a teenager - nope it was now dubbed Mr. Kitty's house. As it turns out, Mr. Kitty was the only one home when we arrived and he wasn't sure how to open the door. 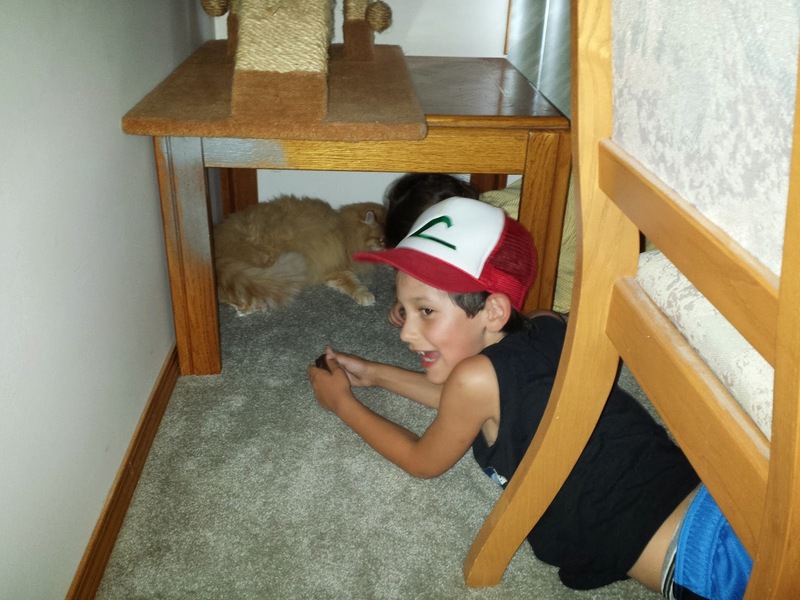 But the kids had plenty of hanging with Mr. Kitty time during our visit. Mr. Kitty was indeed an affectionate cat. He would rub up against anyone he deemed worthy of petting him. At first he was totally in with all the attention the kids were paying him. But when a cat decides that's enough, then that's enough. Or at least Mr. Kitty was hoping. Terry and I were chatting with the family on the lower level. Every time we looked up the stairs we would witness a big orange cat running across our view with two children in two and plenty of giggles. 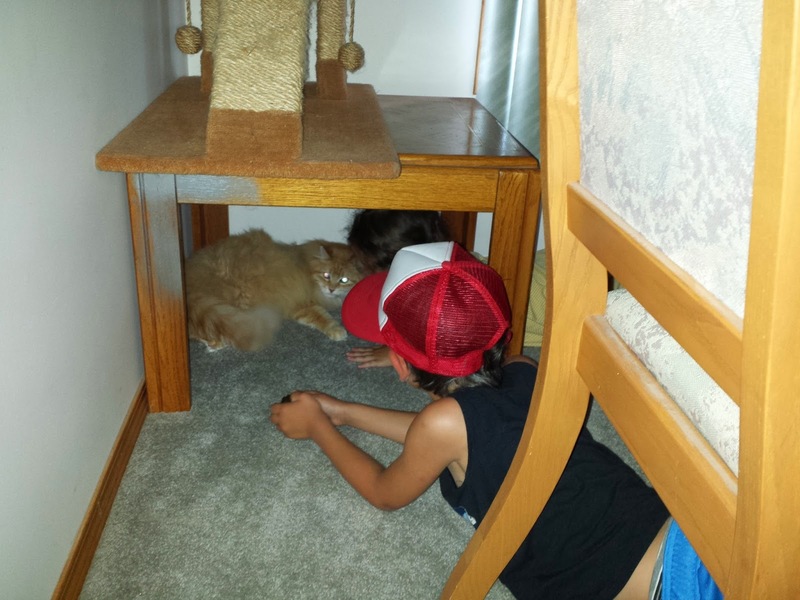 Mr. Kitty thought he could hide under a table, but as you can see from the photos, the kids would just follow him. I really don't think Mr. Kitty minded all that much though. No hisses or scratches occurred and he seemed to enjoy the chase. We were all in a rowboat with a freakin' mountain surrounding us and tons of picturesque scenery when I asked the kids what their favourite part of our holiday was and both answered right away with, "visiting with Mr. Kitty!" I hope this cat knows what a celebrity he is with my kids. (Although if he's any sort of a cat, he'll think that he's the centre of everyone's world anyway). Yup, our holiday wasn't about visiting with family and seeing the sights in Southern Alberta, it was all about visiting Mr. Kitty.